The project comprises nine Work Packages. The rationale is to have four “technological” (horizontal) WPs and four “organizing” (vertical) WPs. The horizontal WPs start from use cases, requirements and architecture and “produce” trials, experimentations, evaluations, business models and exploitation. WP1 encompasses them all. 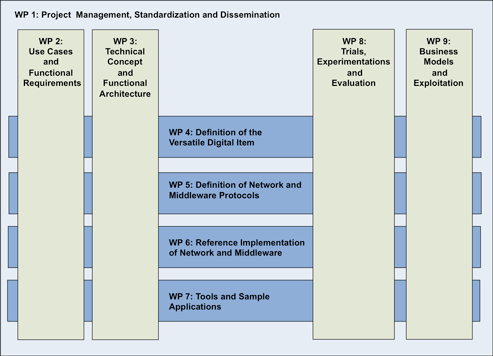 WP 1 Project Management, Standardization and Dissemination: Project management, liaison with the EU, coordination of contributions to EU project clusters, dissemination, contribution to standardization, and management of project technological infrastructure (Website, document server, list server and CVS). As regards Standardization and Dissemination, we point out that the related effort in this WP has to be understood only as coordination of such activities. The actual production of standardization and dissemination contributions will take place in other WPs, according to the nature of the contributions themselves. WP 2 Use Cases and Functional Requirements: Definition, validation and refinement of use cases for CONVERGENCE, with potential users and extraction from the use cases a set of functional and non-functional requirements, for a mature CONVERGENCE framework. 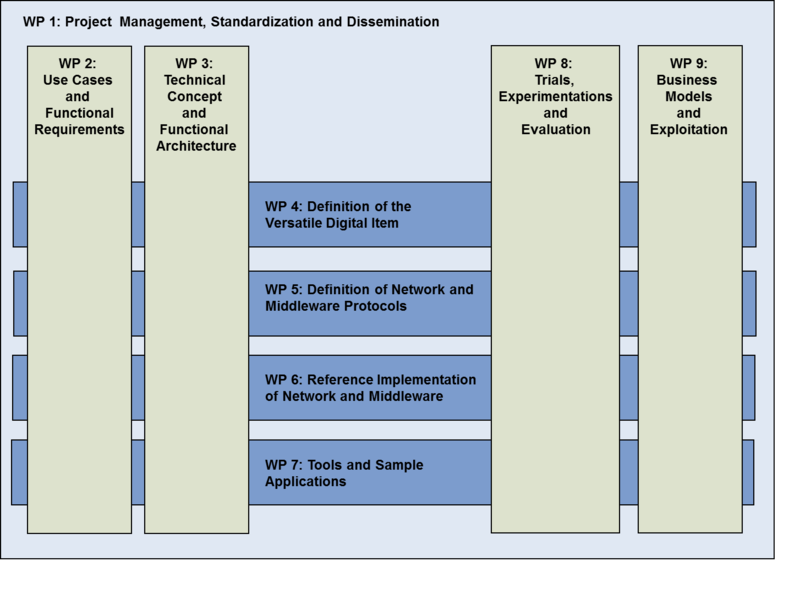 WP 3 Technical Concept and Functional Architecture: Specification of the CONVERGENCE technical concept and the functional architecture for the CONVERGENCE framework. Based on the use cases and functional requirements , mapping of these requirements to a technical and functional architecture. WP 4 Definition of the Versatile Digital Item: definition of the VDI, extending the scope of the MPEG-21 DI by including new classes of object (including RWOs, services and people) and supporting new classes of operation. WP 5 Definition of Network and Middleware Protocols: definition and implementation of the protocols for communication between CONVERGENCE middleware entities residing on connected devices and hosts and for providing the required network-level functionality. WP 6 Reference Implementation of Network and Middleware: develop of the reference implementations of the network and middleware, for a subset of the platforms, devices and protocols previously identified. WP 7 Tools and Sample Applications: specification of the tools and four sample applications, subsequent implementation tools and applications and performing preliminary technical testing. WP 8 Trials, Experimentations and Evaluation: execution the four trials whit evaluation of the functionality and performance of the CONVERGENCE middleware and of tools and sample applications and study user perceptions of the functionality of the sample applications during the trials. WP 9 Business Models and Exploitation: identification of the promising business models enabled by the developed technology; possible mappings between the business models and partners’ plans and preliminary business development plans based on any applications which present the partners with commercial opportunities.